I wasn’t sure how my son would react to the idea of joining a book club for boys. Of course, he had some questions like, “how much work is it going to be?” But, he agreed to give it a try. After five years, the book club is still going and my son still looks forward to getting together with his buddies each time. That doesn’t mean they’ve always enjoyed reading the selected book, but it has allowed him to read a variety of books from different genres. 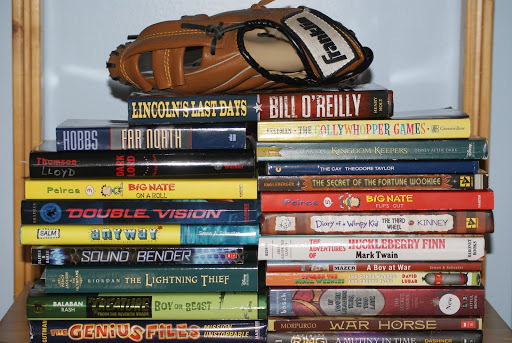 Book clubs for boys are becoming more popular and it’s a great way to motivate boys to read. For one, they are with other boys their own age (NO GIRLS ALLOWED, other than moms) and two, it’s a relaxed environment with no tests or grades. Below is a summary of how to start your own boys book club. 1. A good start is a group of 6-8 boys along with their parent. Anymore than that and the discussion could take too long (short attention span). Also, those boys who are uncomfortable speaking in a group may be less likely to join in on the discussion. 2. Depending on the size of the book, the parents should decide how often to meet. We typically meet every 4-6 weeks. 3. Each boy should take a turn picking a book to read. They are encouraged to change genre’s each time. We have read historical fiction, fantasy, non-fiction, biography, mystery, etc. My son didn’t enjoy every choice, but he was exposed to different genre’s that he would not have picked on his own. 4. There are some great resources for selecting books. A couple of websites we use are gradereading.net and Good Reads. You can also search Amazon for books based on age. 5. Food is another great motivator. Our groups usually serves snacks, dessert or even dinner. We try to tie in the food selection with the book theme. For example, when the boys read “Lincoln’s Last Days” the host looked up Abraham Lincoln’s favorite foods and served fried chicken. 6. The host should prepare some discussion questions, however, it is helpful for all the parents attending to participate in the discussion. 7. And, of course, always leave time for the boys to just hang-out and have fun. Posted on June 18, 2013 March 25, 2015 by debbiedaurelioPosted in UncategorizedTagged #bookclub, #boys. Next Next post: 10 Ways NOT to Get Published.